This is a pair of pre-mounted Sling Shot Paddle tires for X-MAXX. Pro-Line is ready to unleash the Sling Shot paddle tire for X-MAXX owners! Pro-Line Sling Shot tires are known for having an incredible scale paddle tire appearance combined with unbelievable Sand and Snow performance! These tires have been developed from the ground up for extreme X-MAXX punishment with an all-new ultra-durable compound that prevents tire ballooning even at high speeds. The Sling Shot 4.3" tire features Pro-Line's ground breaking proprietary Pro-Loc Technology that creates an ultra-secure bond to Pro-Line's Impulse Pro-Loc X-MAXX wheels while still being removable when required. The reinforced Tire bead fits into a uniquely shaped channel on the wheel and the bead-loc screws actually pass through the tire rubber before being pinched by the outer bead-loc ring to create the maximum possible mounting security. 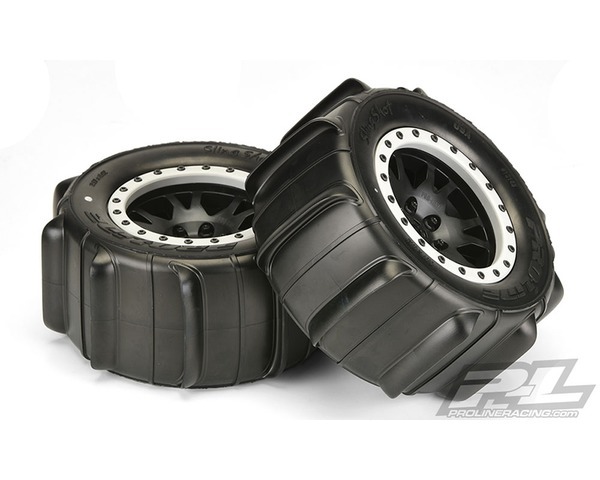 This technology debuted on the Badlands MX43 Pro-Loc Tires and has proven to be extremely popular for the X-MAXX fans. The Sling Shot tires come pre-mounted to Pro-Line's Pro-Loc wheels. Pro-Line has the ultimate Wheel solution for X-MAXX owners with the all-new Impulse Pro-Loc Wheels! The Impulse design is inspired by full-size off-road wheels with a Tough, Blacked-out look and is manufactured at Pro-Line Headquarters in the USA out of extra thick, extremely durable material designed to take some serious abuse. The look of the Impulse Pro-Loc Wheel is finished off with the Stone Gray Bead-Loc Ring that will get your truck noticed wherever you go! If you want to take your X-MAXX to the next level of Sand & Snow Performance and throw up huge rooster tails then you need to get Pro-Line's new Sling Shot 4.3" Pro-Loc Tires mounted to Impluse Pro-Loc Wheels!